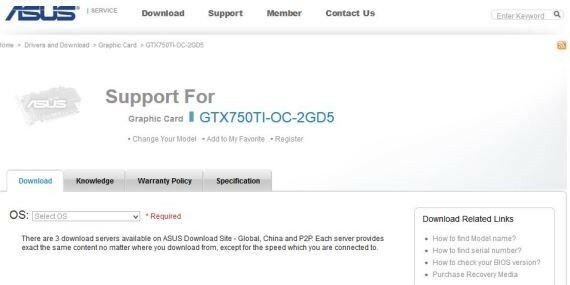 Recently, some European online retail stores listed on their site the yet to be released Asus GeForce GTX 750 Ti, based on the new Maxwell chip. It has a model number GTX750TI-OC-2GD5 suggesting that this graphics card comes with a factory overclock settings. But since it doesn’t have a “DC2” on its model number, this tells us that it might have a reference cooler. Knowing Asus, I’m sure they will release a GTX 750Ti OC with their award winning GPU cooling solution DirectCU II soon, hence Asus GTX750TI-DC2OC-2GD5. Based from the model number alone, we can say that the Asus GTX 750 Ti OC will have 2GB of GDDR5 memory. And according to the site that listed the graphics card, it has an initial price of around $225 USD and in some European online store it’s around 180 Euro. That may not be a reasonable price even if it is a pre order price. It’s just too expensive considering that the GTX 750 Ti, according to initial benchmarks leaked, is around 15% slower than the GTX 660 Kepler. According to Videocardz.com, the first Maxwell graphics cards (in this case the GTX 750 Ti) are just refreshed from Kepler. Meaning we won’t be seeing anything really exciting even if it is using a new chip. Meanwhile according to Techpowerup, the GTX 750 Ti will be available or released starting February 18, 2014. It’s just a little disappointing since NVIDIA will be releasing their first graphics card that doesn’t show any significant improvement over their Kepler based graphics card. Perhaps they are just saving the best for last. I’ll post update on this soon. GeForce RTX 2070 Compared – What’s the Best RTX 2070 To Buy?